Offense: California has an offense that has improved greatly towards the end of the year. They rely heavily on the running game, led by RB Isi Sofele, who has over 1300 yards this season. Backup C.J. Anderson is also a vibable threat for the Golden Bears. QB Zach Maynard is at the helm and his play as gotten better over the course of the year. He should pass the 3000 yard mark against Texas. His top receiver is Keenan Allen, who has 89 receptions for 1261 yards. The offensive line will need to be hold off a very strong and aggresive Texas defense. Texas has an offense that is a blast from the past, as they are quarterbacked by Case McCoy, brother of Colt. He has struggled this year and will split time with David Ash at that position. Texas will try to pound the ball against the Bears. Malcolm Brown is the leading rusher, averaging 4.4 yards a carry. When one of the quarterbacks looks to pass, Mike Davis and Jaxon Shipley are the top targets. For the Longhorns to be effective, they must be able to run the ball to set up the pass. Defense: California brings a strong defense into the game that must slow down the Texas rushing game. Inside linebacker Mychal Kendricks was named PAC-12 defensive player of the year and anchors the linebacking corps with D.J. Holt. Senior safety Sean Cattouse is a leader in the secondary, a unit that has had trouble. The Golden Bears must get a strong pass rush to make up for a vulnerable secondary. Texas has one of the best defenses in the country, coordinated by Manny Diaz. They give up 23 points a game, and apart from being picked apart by Baylor, they have been very strong the second half of the season. Chris Whaley and Calvin Howell anchor the Defensive line. At linebacker, Emmanuel Acho and Keenan Robinson are the keys. The Longhorns will get pressure on Maynard in as many ways as possible. The pick: I like Texas to win this game. I think that their defense is too strong for Cal. It will be a close game, but Mack Brown gets win number 8 on the season. If you agree or disagree let me know why by tweeting me @bowlseason or emailing me at ryzim22@yahoo.com . I'll post them if you send them. We picked Texas to win. We are now 7-5. BS: The Longhorns started the year 6-2, but finished 1-3. What changed over the second half of the season and how would you rate the season overall? Alan Trubow: What changed was a combination of injuries to key offensive players along with the level of competition. The last four games were a significant step up in competition compared to the first eight games (excluding Oklahoma and Oklahoma State, which were the Longhorns' two early losses). The step up in terms of caliber of opponents coincided with injuries to not only the Longhorns top three running backs (Fozzy Whittaker, Malcolm Brown and Joe Bergeron) but also to their top receiver, Jaxon Shipley. As for the 7-5 season, I'd rate it as expected. If that's a rating. In fact, I predicted 7-5 at the beginning of the season. Had the Longhorns been healthy, it's possible Texas could have beaten either Missouri or Kansas State. BS: The offense certainly struggled at times, but had some success with familiar names McCoy and Shipley. Talk about the year the offense has had and who else is important for its success? Alan Trubow: It's all about the quarterback position. Currently, Texas has two quarterbacks on its roster in David Ash and Case McCoy. Both those quarterbacks have had an opportunity to earn the starting job. Neither has come close to performing at that level. In fact, Texas is planning on rotating quarterbacks in the Holiday Bowl. It's not because they want to use a two-quarterback system. It's because the Longhorns don't trust either guy to run the full offense for 60 minutes. What's amazing is the Longhorns began the year trying to choose a starter from four quarterback candidates. Two guys transferred, including incumbent Garrett Gilbert. After 12 games, many Texas fans believe the Longhorns lack a single viable option at quarterback. BS: Apart from a few games, the defense has been very solid. Who and what make that attacking defense coordinated by Manny Diaz so successful? Alan Trubow: The defensive success is a combination of the players and the scheme. Manny Diaz will be a head coach very soon. His defenses have a tendency to confuse opponents because you really never know what's coming. It took a while for the Longhorns to learn the system, and that caused some hiccups early in the year. But once the lightbulb went on, the Longhorns really became a dominant defense with the exception of the performance at Baylor. The biggest keys were guys like Chris Whaley and Calvin Howell stepping up at defensive tackle, linebackers Emmanuel Acho and Keenan Robinson clogging up the middle and the young secondary being better than expected. Alan Trubow: He's already had a couple of big games, so I'm not sure if it constitutes as a breakout performance, but I expect Jaxon Shipley to have a big game. He was injured the second half of the season. The loss of Shipley really hurt the quarterbacks and the offense. He contributed in the win against Texas A&M, including throwing a 40-yard touchdown pass, but the true freshman didn't really produce like he did early in the year. 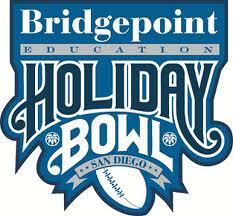 I expect that to change in the Holiday Bowl as Shipley is healthy and will be a big part of the offense. I see him possibly having more than 100 receiving yards and throwing a touchdown, too. Thanks a lot to Alan Trubow. Check his work out at www.Hookem.com and follow @atrubow . Joe Stiglich, who covered California football this year, and is also on the Oakland Athletics beat for the Oakland Tribune, answered some questions for us. BS: The Bears were very up and down this year, finishing 7-5. How would you assess this season overall? Joe Stiglich: I'd say Cal has been about as advertised before the season began. The Bears appeared to be a near-.500 team heading into the year, and that's proven to be true. They have beaten the teams that they appeared superior to on paper, and were outclassed by the upper-echelon teams in the Pac-12. One big disappointment was a lopsided midseason loss at UCLA, a game in which Cal looked to be a solid favorite and simply got dominated. On the flip side, the Bears gave a better showing than expected against highly ranked Stanford on the road. All in all, if you told the rational Cal fan that this team would go 7-5 and play in the Holiday Bowl, that fan would have to be pretty pleased with that result. BS: The offense has been pretty good, led by the airiel attack of QB Zach Maynard. How does this offense play and how are Maynard's top weapons? Joe Stiglich: The Bears were at their best late in the season, when they simplified the game plan and leaned heavily on their running game. Maynard struggled with inconsistency through the first half of the season, and once the running game got cranking behind a veteran offensive line, he cut down on his interceptions and the offense just became more efficient. The top weapon undoubtedly is sophomore receiver Keenan Allen, a threat to score a touchdown anytime he catches the ball in the open field. Undersized tailback Isi Sofele showed he can be an effective everydown back in the Pac-12. Late in the season, backup tailback C.J. Anderson started contributing as well. He's a bigger, more physical runner than Sofele and provides a nice complement in the running game. successful in the bowl game, and who are the key players? Joe Stiglich: Cal's pass defense has given up plenty of big plays over the past couple of games. The team hasn't tackled particularly well either. I'd say a key against Texas is helping that secondary with a good pass rush. The Bears have had lots of time to game-plan different ways to bring pressure. Inside linebackers Mychal Kendricks-- the Pac-12 defensive player of the year -- and D.J. Holt are the anchors. Senior defensive end Trevor Guyton is a force on the edge, but the Bears have also gotten contributions from young players such as defensive lineman Mustafa Jalil and linebacker Cecil Whiteside. Senior safety Sean Cattouse has to make plays in the secondary. Thanks a lot to Joe Stiglich. Check his work out at www.insidebayarea.com and follow @joestiglich .